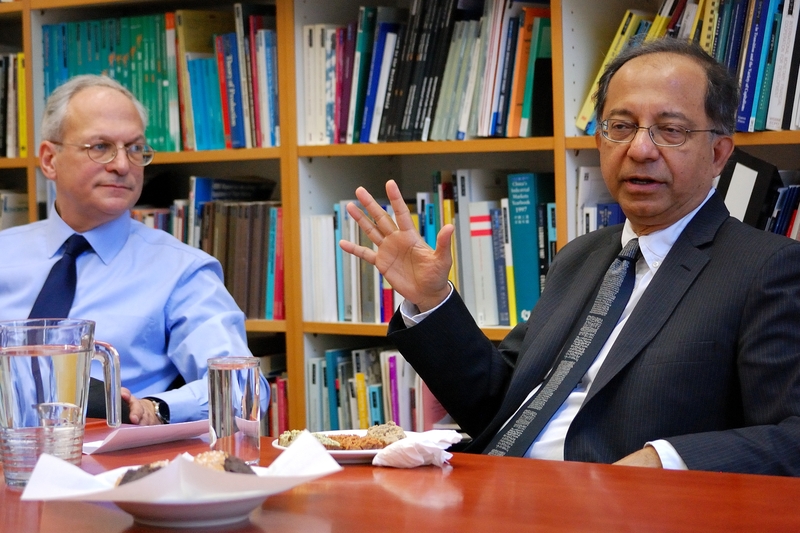 Kaushik Basu, Chief Economist of the World Bank, captivated the audience of the OeNB-wiiw Global Economy Lecture with his talk on challenges of globalisation. 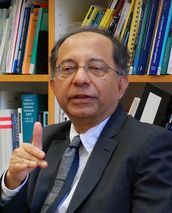 Kaushik Basu, who as of today is Senior Vice-President and Chief Economist of the World Bank, has covered in his research a broad portfolio, ranging from industrial organisation to game theory and development economics, which was strongly influenced by his PhD supervisor Amartya Sen at the London School of Economics. 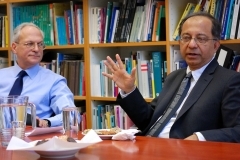 From 2009 to 2012 Kaushik Basu held the position as a Chief Economic Advisor to the Government of India. In his research he attempts making economics and politics approachable and understandable to the broad public, just as he did in this presentation. In the lecture he highlighted that while the world economy was expected to recover due to developments in Europe and the US, big emerging economies have started to stumble. Three out of five BRICS countries, namely Brazil, Russia and South Africa, show a negative growth prospect. The low oil price, which is a burden to oil exporting economies but a boost for oil importing economies, is expected to stay low due to the cost structure of shale oil production, with very low fixed costs and variable costs ranging between 55 and 70 US$. In addition, a raise in interest rates in the US can be expected by December this year. Together with the quantitative easing of the ECB, this led to an appreciation of the US dollar leading to a downward pressure on capital flows to developing countries. Kaushik Basu stressed, that in a globalised economy, the analysis of spill-overs is of particular importance. A hat seller – tired from walking from village to village to sell hats – took a rest under a tree and fell asleep. When he woke up, all his hats were gone. After a first shock he noticed that monkeys sitting in the trees were wearing the hats. Furious and not knowing how to get them back, he took his own hat from his head and threw it to the ground. To his surprise, the monkeys imitated him and threw their hats to the ground too. Quickly he collected his hats and happily took off. On those grounds, he argued that the discussion on whether globalisation is good or bad is pointless, as the process of globalisation – for him comparable to the laws of gravity – is beyond the control of individuals or corporations. Yet, he stated that he believes that globalisation overall enlarges “the cake” and the issue is how to share it globally. new approaches to effectively tackle the problem of corruption. The annual Global Economy Lectures are designed to present issues of global economic development by eminent international economists to a wider public. They are jointly organized by the Oesterreichische Nationalbank (OeNB) and the Vienna Institute for International Economic Studies (wiiw).